The incident which involved Malaysian vessel Polaris and Greece-registered bulk carrier Piraeus grazing each other this afternoon occurred within Malaysian territorial waters and not Singapore, said Malaysian Marine Department director-general Baharin Abdul Hamid. Clarifying a news report on the incident that happened at 2.28pm, he said the Polaris was responsible for monitoring the safety of vessels navigating in the waters around the Johor Bahru port. "It’s within Johor Bahru port limit. So, no question of unauthorised entry into Singapore waters. We engage Polaris to monitor the safety of navigation within the area. It’s our port (to justify the presence of Polaris),” he told Bernama. 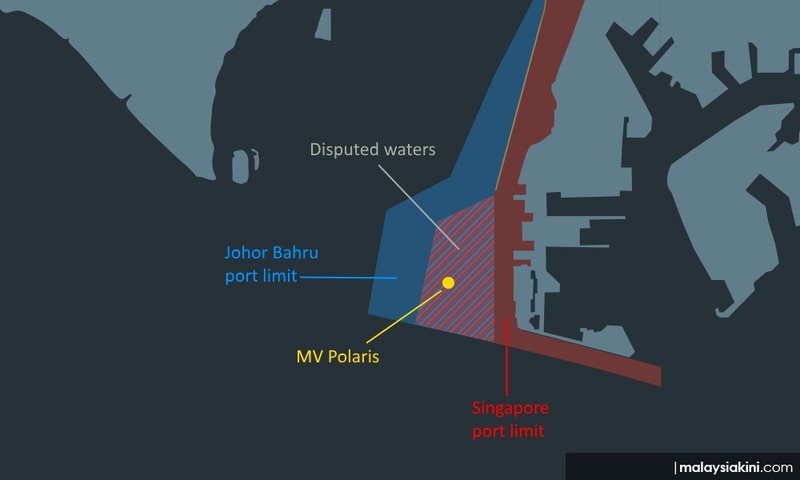 Singapore Maritime and Port Authority in a statement this evening, claimed that the incident occurred in Singapore territorial waters within Singapore port limits off Tuas. The republic in the statement had also expressed their deep concern that the presence of unauthorised vessels in Singapore port limits could cause confusion for the international shipping community and threaten navigational safety in their waters. "There is no serious damage to the ship, there is no rupture for the water to seep in. The incident also did not cause any threat to pollution,” he said. Currently, he said an investigation team was already set up and had begun their investigation into both vessels. "They are already aboard both vessels. We will be carrying out a survey of the vessels for us to establish the actual damage. Once we have assessed, only then can we decide on the next course of action," he added. Baharin said the Polaris, a multi-purpose buoy tender vessel owned by the Marine Department, remained at the location while the Piraeus has sailed to Tanjung Bin jetty and is awaiting ship clearance from the department. Explaining the incident, the ministry noted that the Greek vessel was first sighted entering Johor Bahru port limits in Malaysian territorial waters at 2.15pm today. The ministry also expressed their commitment to take appropriate measures to safeguard Malaysian territorial integrity, interests and safe navigation of all vessels.